Leaving Plymouth on a reasonably bright morning and with the forecast for north westerlies and possible wave it was hopeful for a good days flying. Unfortunately arriving at the airfield I was greeted by low cloud. 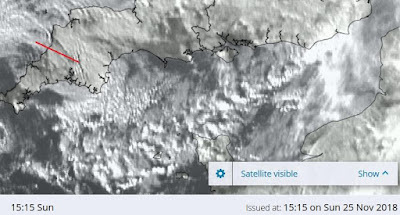 Although there were signs that the cloud was clearing some stubborn low cloud remained over the airfield. But it continued to slowly clear and ever optimistic we readied the airfield to fly. 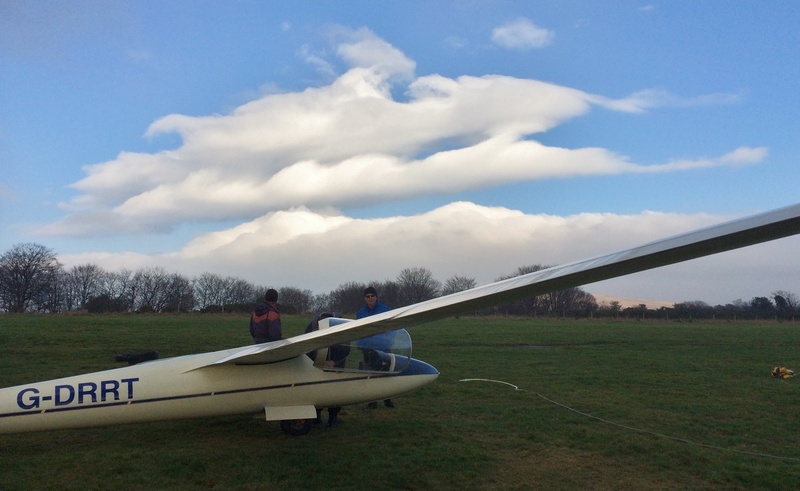 One club K13 was taken out and three private gliders rigged, SF27 (Barry Green), Zugvogel 3b (Roger Green & Andy Davey) and a dart (Leith Whittington). I finally decided to take a weather check flight at 12:41 with Martin Cropper. We launched into clear air to the east over Mary Tavy and found some definite wave and were climbing at 1-2 knots. Unfortunately the cloud was seen to be encroaching back towards the airfield. So it was open airbrakes and descend to circuit height and land before the cloud encroached too far. We stood down for an hour, by which time the cloud had cleared well to the west. Barry Green (SF27), Roger Green (Zugvogel 3b) and Leith Whittington (Dart 17R) all took a launch. Barry and Roger returned after extended flights of 16 and 19 minutes respectively. Leith could be seen north of the airfield initially maintaining height, but then found some more defined lift and could be seen steadily climbing. Steve Fletcher and I took a launch in the K13 to hopefully follow Leith’s way. Again off the top of the launch we noticed that the cloud was approaching from the west. We lost sight of Leith so again we took the safe option to return and land before the cloud came too far east. Leith returned after a 51 minute flight. He decided to quickly descend seeing the cloud approaching from the east as we had in the K13. 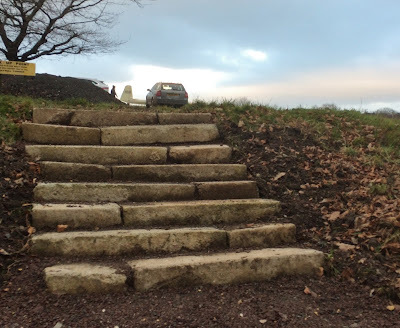 Another new flight at the club is the steps between the hangar and the clubhouse. A nice addition by Colin Boyd. Only five flights, but we made the best of the short breaks in the cloud. Thanks go to Mike Bennett for winching and his efforts in the continuing clearance on the site. Also thankyou to Heather for retrieving and others who helped without flying.